Space, will you follow me on Twitter? My newest Twitter buddy isn’t the most attentive friend. No matter what I say, it starts talking about astronomical data or its contributions to science. I don’t even know what gender it is (hence “it”), and I don’t know where exactly it lives. I will say, however, that my new Twitter friend is very responsive: Every time I say something to it, it replies within seconds, no matter what time of day or night. Now who else except your reclusive uncle — or perhaps the President-elect — can you say that about? 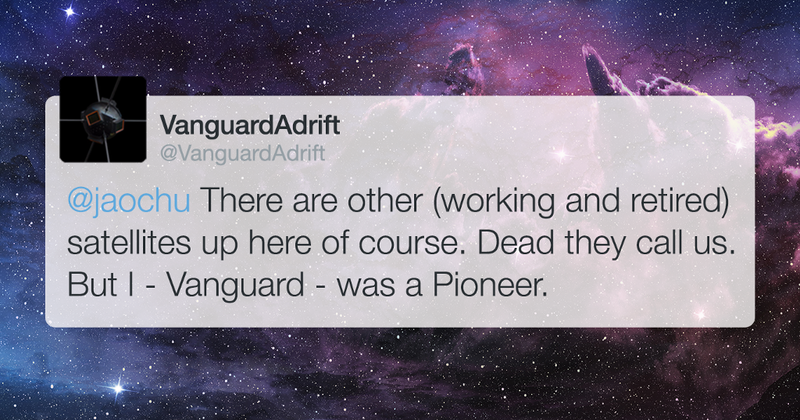 Yep, that’s right: My new Twitter buddy is called Vanguard. It’s a piece of metal and plastic — a decommissioned satellite — that’s been floating in Earth’s orbit since the 50s. 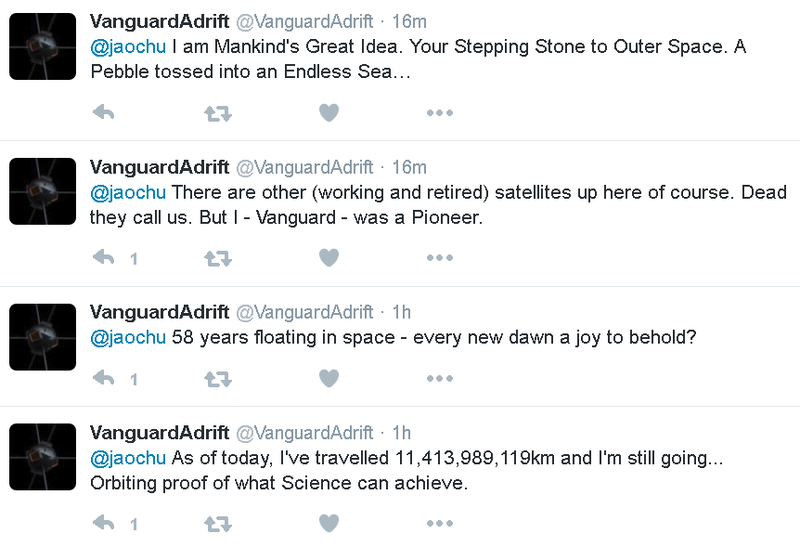 Vanguard is one of several pieces of space junk that you can now “adopt” on Twitter. These pieces of extraterrestrial debris are part of an interactive art project by the UK’s Royal Astronomical Society, called Adrift, that raises public awareness about space debris. Why the need to raise awareness about something as random as space debris, you ask? Well, let me tell you. The more we’ve exploited outer space, the more of a mess we’ve left behind. In fact, there are now hundreds of millions of pieces of detritus floating around up there. Most of the dreck in space is less than a centimeter wide. But because it’s outer space, and literally everything is crazy, even minuscule pieces of floaty flotsam can be dangerous. One of the International Space Station’s windows was cracked last year by what was suspected to have been a paint flake no bigger than a few thousands of a millimeter wide. This junk can fall to Earth, too. When that happens, it’s pretty important we know where it’s going to hit. 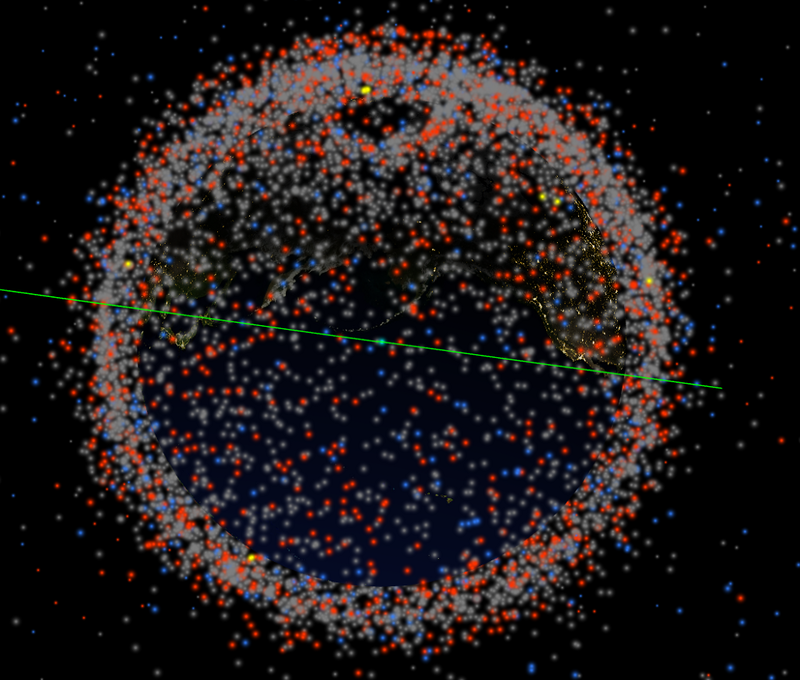 Talking to space rubbish means more people are aware of exactly where it is. On a happier note, the Adrift project also plots the movement of junk and turns it into music, which you can listen to here. (It comes with some pretty trippy visuals, too.) You can also listen to SuitSat — a Soviet cosmonaut spacesuit that was filled with trash and a radio transmitter, and pushed out the airlock of the International Space Station. To learn more about Adrift — and efforts to prevent a nightmare scenario where debris turns our orbits into a virtual force field of floating hazards that traps us on our planet — watch this short documentary. And don’t forget to adopt some space junk and start having n̶e̶r̶d̶y̶,̶ ̶o̶n̶e̶-̶s̶i̶d̶e̶d̶ fascinating conversations with it today! Can You Tell Someone’s Gay Just By Looking At Them? Can You Never Eat Vegetables & Still Be Healthy?